Sony learned some important lessons with the Eyetoy, says Sony's European boss. Sony's Andrew House thinks that Microsoft will come to regret its choice of technology with Kinect, as it was very hard to design a wide variety of games that would work with just a camera as a controller. 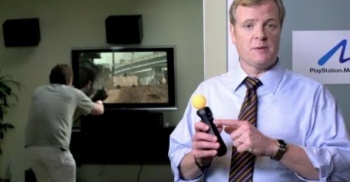 House said that Sony's experience with the EyeToy had shown it just how limited camera-only gaming could be. It worked well for certain genres, he said, but that Microsoft would hit a wall when it came to others. He said that it was especially hard to adapt traditional gaming genres to use just a camera. He said that those limitations were why Sony had steered away from making another EyeToy and went with something with a few more buttons instead. He thought that Kinect's limitations would hurt Microsoft in the future. Despite the very strong marketing campaign for the device, he said, advertising could only carry it so far. Ultimately, it would be strong content that was really important and that was where Move had the edge. House does have a point: An out of the box Move setup does allow for a wider variety of games than an out of the box Kinect setup. But Kinect is designed to accommodate more than just what comes in the box. Last month, Microsoft's Alex Kipman talked about "hybrid games" that used both the motion control camera, and a standard controller. He also mentioned that Kinect could track things other than people, so some games might have specialized peripherals, rather than trying to do everything with the camera. Of course, you have to remember that House is not only talking about a rival product, he's talking about a rival product that has seemingly outsold Move by a significant margin. He's right that content will be important in the future, but Kinect isn't quite as limited as he would have people believe.